SJF is the nation’s largest stocking distributor of new and used material handling equipment, serving more than 70,000 clients in the US and abroad. 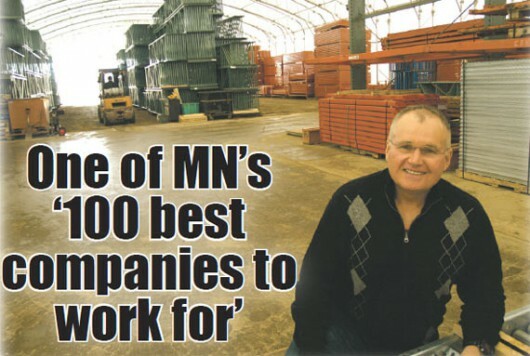 The sales staff helps these clients obtain forklifts, pallet racks, conveyors, and related items. A typical day could involve contacting customers, answering phones, following up on quotes, or doing on-site visits. “It’s not all sitting behind a desk; I recently went to Gedney, home of the Minnesota Pickle,” said sales rep Jason Deiter. When Deiter was hired in December 1991, he worked as a grinder. As the years went on, he became skilled in multiple departments, such as welding, painting, forklift operation, and management. “We try to put people in positions where we can use their talents – in other words, things they like doing,” Stafford said. A sales opportunity arose in 1997, and Deiter quickly accepted the challenge. “I’ve never looked back,” he said. Compensation for SJF sales reps is commission-based, and isn’t tied to a college degree or seniority in the work place. Sales reps are given latitude on product pricing, and customer contact is documented in a detailed database. “The customer remains yours until you decide you don’t want to serve them anymore,” Stafford said, explaining that if sales reps don’t stay in touch, the account is free for another rep to take over. Employees say that job flexibility, proximity to home, and team-building activities are a few of the perks of working at SJF. “We have a lot of events that don’t necessarily cost a lot of money,” Stafford said, giving examples of company barbecues, and the basketball hoop that’s outside for people to use during lunch breaks. Every year, many SJF employees participate in fishing contests, with prizes given out each month. This summer, SJF is hoping to start a trapshooting league, and might also organize a golf tournament. Some employees participated in a weight-loss competition for New Year’s, and progress was documented on the company’s Facebook page. “Half of them actually gained weight at the end,” Stafford said, adding that Facebook helps customers get to know SJF on a more personal level. 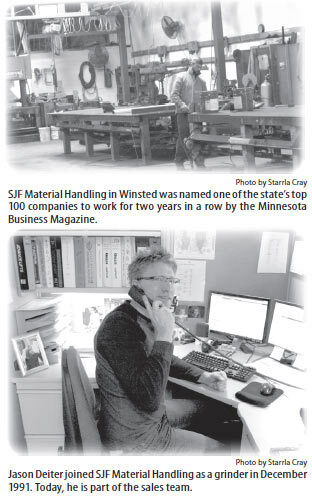 When the Internet was beginning to take off, SJF was one of the first companies to implement online sales. Today, Stafford finds ways to stay ahead in online marketing, and has 47,000 followers on Twitter, as well as a popular blog. “On our blog, we’re serious, but we also make fun of ourselves,” Stafford said, explaining that posts range from information about new products, to the latest fishing contest photos.